Standing before thousands of fans, the Mercedes AMG driver was taken aback when presented a real Ayrton Senna helmet from the Senna family collection for matching his idol’s second-place record of 65 poles. 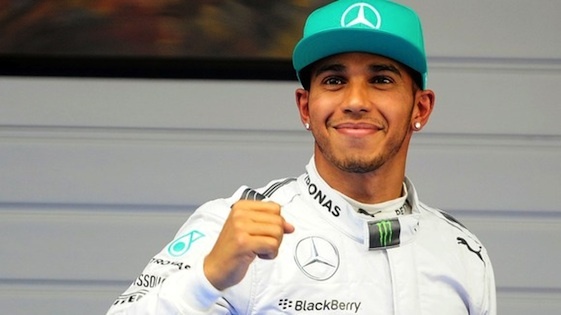 Hamilton now is only three short of Michael Schumacher’s all-time record. Hamilton toured the 2.710-mile/14-turn Circuit Gilles Villeneuve in Montreal in a track-record 1-minute, 11.459-seconds for Round 7 of 20 of the FIA Formula One World Championship. Vettel’s best lap was of 1:11.789-seconds for the Prancing Horse. “My final lap worked perfectly,” Hamilton said. “I could see my delta picking up and getting excited, but at the time I had no comprehension about the 65th _ I forgot that, it was the here and now. I just want to say a big thank you to my family for supporting me all these years and giving me the opportunity to be here today. I am standing here today, but the work they put in behind me… no one could imagine. But I know. After being beaten by the Scuderia in practice Saturday morning, Mercedes found something extra for the afternoon. Hamilton’s teammate, Valtteri Bottas, took third ahead of Ferrari’s Kimi Raikkonen in the second Ferrari. Red Bull wasn’t far off the pace, with Max Verstappen and Daniel Ricciardo fifth and sixth, respectively, followed by Williams’ Felipe Massa, the Force Indias of Sergio Perez and Esteban Ocon. Renault’s Nico Hulkenberg completed the top-10. Meanwhile, American-owned Haas F1 Team drivers Romain Grosjean and Kevin Magnussen qualified 14th and 18th, respectively.